Having trouble with directives and components in Angular 2? 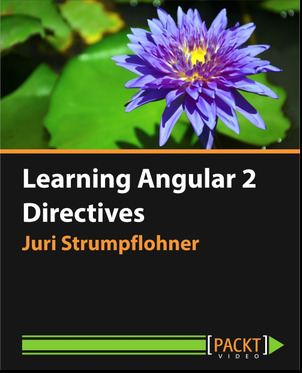 Recently, Juri Stumpflohner published a video course entitled "Learning Angular 2 Directives." Check it out! Finally, I managed to finish and publish my very first video course: "Learning Angular 2 Directives" by Packt Publishing. So relieved! Read on for an overview on what it is all about! Well, as the title says, this video course focuses on the core part of Angular 2, directives and components, the latter actually being a specialization of a directive. Yeah, that’s also something you’ll learn in the course! During the entire course, we will basically pair programming with sample applications which we’ll use to discover and learn the new concepts behind Angular 2. TL;DR: head over to the official page to get more details and buy a copy. The course basically starts off by giving you an introduction to the modern tooling. We’ll explore some of the new and most important ES2015 (formerly known as ES6) concepts and create a setup with TypeScript and SystemJS. You will then learn about the concept of components and web components, something that is nowadays common for all the big player front-end frameworks such as React, Ember, Angular, and obviously the more pure implementations like Polymer. From section to section we will then discover new concepts around Angular 2 components, data flow, events, styling, content projection, etc. Besides that, we also cover unit testing, debugging, and end-to-end testing, which I summarized under the chapter maintaining components. Finally, we'll get into some of the more "fancy" stuff as we demo Angular 2 running on mobile with Ionic 2 and Angular on the server with Angular Universal. Great. This video has been created by me in collaboration with PacktPub. While I did a couple of technical reviews with PacktPub already, this was my first video I produced on my own. Lots of sweat, but totally worth it and I’m glad it’s out now. That said, it also means this is a paid course, currently sold by PacktPub. Still interested? Then go ahead and grab your copy. Many thanks to my girl which gave me all the support I could imagine during this quite intense phase of producing this video course. Also, thanks to Nathan Walker for doing the tech review. I’m so glad I had him on board as he’s such an active and valuable Angular community member right now.